Credit holds and credit limits can be used to control the credit extended to customers and reduce your organization's exposure to risk. When an account has a credit hold, new invoices cannot be created for that customer. 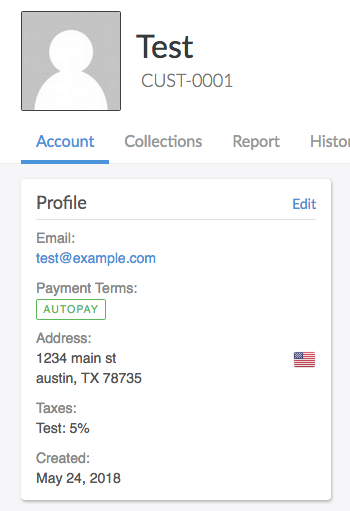 Open the customer's account in the Invoiced dashboard. Click Edit. In the More Options section, toggle on the Credit Hold option. Click Save to finalize the credit hold. New invoices cannot be created for this account because it has a credit hold. Credit holds can be released through the same process as adding a credit hold, by simply toggling the credit hold option off on the customer. A credit limit puts a restriction on the amount an account can have outstanding at a time. When there is a credit limit for an account, each time an invoice is created, Invoiced will check to see if that causes the customer to exceed their credit limit. When in excess of the credit limit the invoice will be rejected. In the More Options section, check the Has credit limit option and enter in the credit limit. Click Save to finalize the credit limit. This invoice cannot be created because the new amount outstanding ($11,000.00) exceeds the account's credit limit ($10,000.00). Credit limits can be modified or removed through the same process as adding a credit limit.